Lara (Anderson) Johnson, also wanted to utilize bright colors, but in a different way. 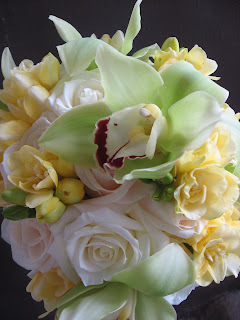 She chose to add ivory roses to her bouquet of yellow freesia and bright green cymbidium orchids. The yellow and green accented each other well while the ivory helped give it all a classic bridal look. The whole look was carried through at her reception at the Piper Palm House with the same greens, yellows, and ivories. Another option is to do what Emily (Murnin) Tochtrop did for her wedding. 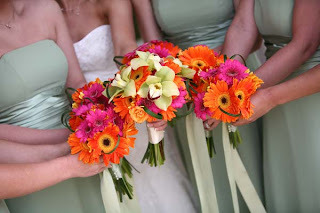 Emily chose bright pink mini calla lilies with orange nerrine lilies in this linear arrangement for her bridesmaids. For the bride, we kept the same look and similar flowers, but designed an all white bouquet. This kept the neutral tones for the bride and the bright splash of color for the bridesmaids. This all worked together at the Hyatt Union Station Ballroom and Grand Hall where the ceremony and reception were held. With so many uses, bright colors can be just the touch of fun you are looking for!